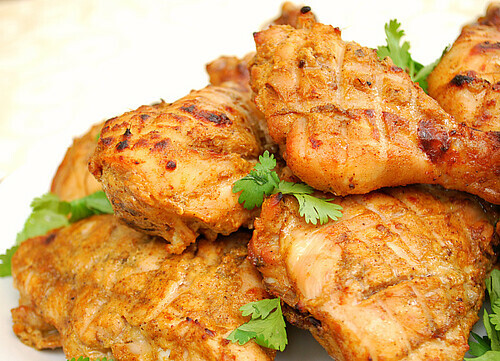 Tandoori Chicken is chicken that's marinated with a blend of spices for 24 hours and is cooked in a special oven called a Tandoori oven. This oven can reach up to 900+ degrees and really gives the chicken a distinct flavor and charred crust. When the folks at Cook's Illustrated tackled this dish to find a way to recreate this chicken at home, I was thrilled! They succeeded with this recipe by creating a spice salt rub for the chicken as well as a spiced yogurt coating. The spices used included garam masala, chile powder and cumin, along with ginger and garlic. Because home ovens don't have the capability of reaching the traditional high heat this dish is cooked in, the chicken is cooked on a low heat first before broiling it to finish, producing a nice smoky flavor with slight bits of char. Overall, this is a fantastic dish and even better is the lack of neon red coloring (a sign of artificial ingredients) often reminiscent of Tandoori Chicken served at restaurants! Heat oil in small skillet over medium heat until shimmering. Add garlic and ginger and cook until fragrant. Add garam masala, cumin, and chili powder; continue to cook until fragrant for another minute. Transfer half of garlic-spice mixture to medium bowl; stir in yogurt and 2 tablespoons lime juice and set aside. Transfer the remaining half of garlic-spice mixture in a large bowl with the remaining 2 tablespoons lime juice, and salt to create a rub for the chicken. Using sharp knife, lightly score skinned side of each piece of chicken, making 2 or 3 shallow cuts about 1 inch apart and about 1/8 inch deep; transfer to bowl. Using hands, gently massage salt-spice rub into chicken until all pieces are evenly coated; let stand at room temperature 30 minutes. Adjust oven rack to upper-middle position (about 6 inches from heating element) and heat oven to 325 degrees. Line a baking sheet with foil and place a wire rack in/on the baking sheet; set aside. After removing chicken from oven, turn oven to broil and heat 10 minutes. Once broiler is heated, flip chicken pieces over (where scored side is now up) and broil until chicken is lightly charred in spots and instant-read thermometer inserted into thickest part of chicken registers 165 degrees for breasts and 175 for legs and thighs, 8 to 15 minutes. Transfer chicken to large plate, tent loosely with foil, and rest 5 minutes. Serve with chutney or relish, passing lime wedges separately. This looks amazing!! I didn't even know you could make this in a regular oven at home. We love indian food and are definitely going to have to try this! oh that chicken looks delicious! I have this same issue of Cooks Illustrated and wondered how it would turn out. Guess I am going to have to try it now. I made tandoori chicken skewers now too long ago and cooking them on the grill makes them better than any I've had at any Indian restaurant! This looks fantastic! This chicken sounds delicious! Like you I am a bit intimidated by cooking Indian food. One of the reasons is that there are usually spices or ingredients that are things I don't normally have on hand and aren't readily accessible. So, I really like that this recipe uses ingredients that are all staples for me. That's a major bonus! Indian food is my weak point as well. I will definetely have to try this recipe.